Another interesting sheet for those who are seeking to make their models a bit different from the norm. 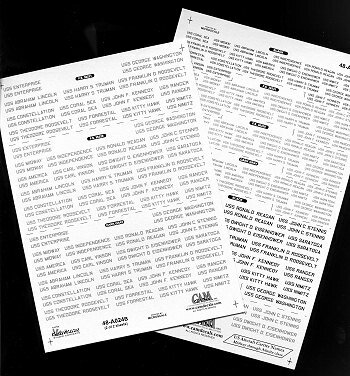 This sheet contains the names of all the carriers from the USS Midway to the USS Ronald Reagan. These are provided in a number of grey shades as well as black and on two sheets. Though listed as 1/48, the smaller ones could easily be used on 1/72 aircraft if one so desires. Naturally, there is no placement guide or instruction sheet with this one. Review sheet courtesy of me. If you would like your product reviewed fairly and quickly by a site that has nearly 400,000 visits a month, please contact me or see other details in the Note to Contributors.